While still in its infancy, the simple AeroFS interface shows great promise, including server-based sync for those who need it. This review is based on a recent beta build that AeroFS's vendor, Air Computing, shared with me. Air Computing tells me that the beta will soon open for the general public, but until that happens, they have provided PCWorld with two thousand invitations for our readers. To enter the closed beta, enter the site through the "Download Now" button on this page and enter the invitation code "8WnhQO". The biggest difference between AeroFS and most other solutions on the market is that AeroFS doesn’t force you to use a central server with a file storage quota. After installing AeroFS and sharing a folder with a friend or colleague, both computers find each other on the cloud (even through firewalls), and start sending and receiving files directly, through an encrypted link. In simple terms, this means there is absolutely no space limitation for the amount of data you can sync. Seeing as how Dropbox currently charges $20/month for a 100GB quota, this is a big deal. I tested AeroFS by installing it on two systems; one is a mid-range desktop machine, and the other a four year-old Toshiba laptop. The laptop was in a remote location, connected via a slow connection and through a dedicated Checkpoint firewall. File sync started as soon as I copied a file into the AeroFS folder, and the simple status dialog showed me exactly how the transfer is going. I synchronized a 150MB file over this link without a hitch, and with impressive speed. I also tested AeroFS on a local LAN; because it was a local link, file sync was very fast, clocking in at around 1MB/s. Because AeroFS does not use a central server by default, you lose one key Dropbox feature: file versioning. Dropbox lets you roll your files back to a date in the past, something I've used on more than one occasion to revert program configuration files to a healthier previous state. 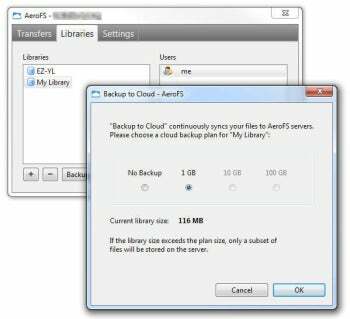 When using AeroFS, you may have to handle file versioning locally on each machine with a backup solution like Oops!Backup. The AeroFS Beta I tested did include a rudimentary option to synchronize files to a central AeroFS server for safe-keeping in the cloud, albeit with a limited storage quota. The company just added a versioning option for libraries synchronized to the central server (making it "just like Dropbox"), but it didn't work when I tested it; such is the way of the early Beta. The thing that impressed me most about AeroFS was that file sync between computers just worked. I can only hope it remains as effective and nimble in the future; I will be using it for sensitive files I want to sync between my machines but keep out of the cloud. AeroFS provides Dropbox-like seamless sync without using any servers, so you can sync unlimited amounts of data.